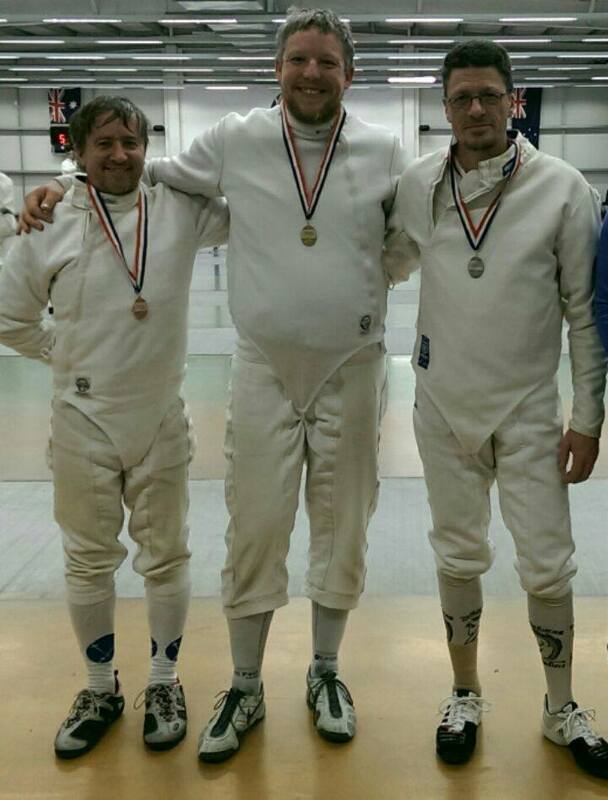 Congratulations to Phil for coming 4th in veterans’ epee competition on Sunday. Great job! – and fantastic to have people out there representing the club at competitions. Congratulations Tim, Oscar and Sean! 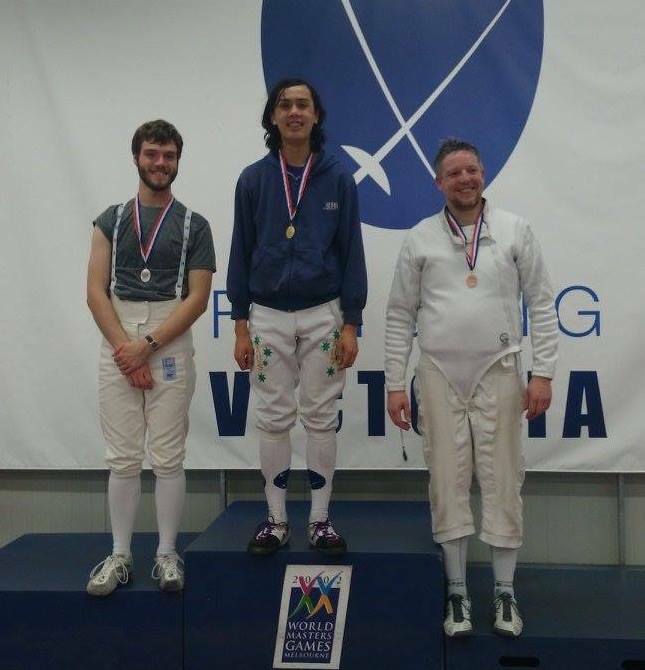 Tim Davis won gold in the B-grade sabre on Sunday, gold in the B-grade epee and silver in the novice foil. 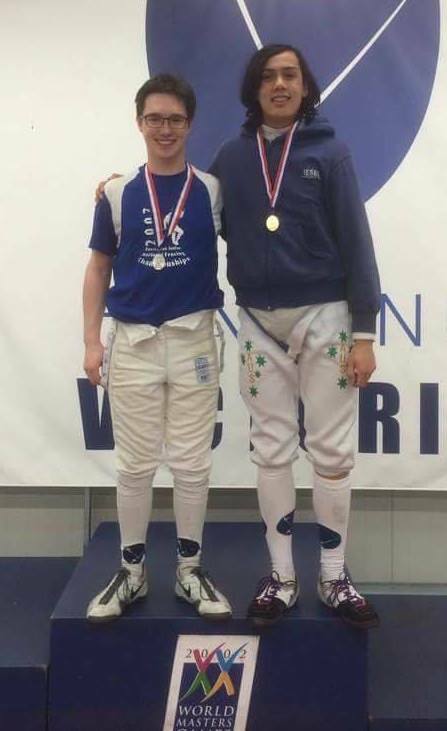 Oscar de Jong won gold in the novice foil. Sean won silver in the B-grade epee. Congratulations to Phil on his silver medal in Sunday’s Veterans Epee competition at Fencing Victoria. Remember, there is no fencing at Nunawading on Easter Saturday. Come to Mitcham on Tuesday the 7th if you can’t last the week. Callum from Monash University Fencing Club will be attending on Tuesday nights for the next couple of months. He is an accredited sabre coach and will be available for individual sabre lessons. His rate is $30 for half an hour. This session will start at 10am with a quick warm-up and footwork. People will then be set up with pool sheets to try and fence as many pool bouts as they can on 3 strips between 10:30 and 11:45am. Any juniors wanting to join in will have already done their warmup and footwork, so they can join in at 10:30 when their class finishes. From 11:45-12:30, we will discuss preparing before the competition and competition psychology, then give people some bout scenarios to practise. Lisa will be available for any specific questions that people have. The cost will be $10 for under-15s, and $15 for adults and for teenagers aged 15+. This coming Saturday (February 7th), we will be hosting a coffee morning for the parents of the juniors (their siblings are also welcome of course). It will be in the meeting area at the front of the Nunawading Community Centre (just go through the double doors after dropping your child at their fencing session). It will be at 9.15am. – State competitions suitable for junior fencers, including the benefits of doing comps and what it’s like to participate in a competition, competition preparation (a training session is planned for the end of February), borrowing club equipment for competitions, and car pooling to make it easier to get there. – Club activities being considered for 2015, including social activities such as Lasertag or outdoor Laser Strike, and club competitions/workshops. – How to get involved and support the club. We will have coffee, tea and nibbles. Please RSVP to Jenny at vicepres@whitehorse.riposte.com.au. Also, please let us know if you are bringing younger children (for catering quantities) and if there are any food allergies/intolerances.